Why is a Stick Bite important? GD: How are stick bites used from a lab perspective? PL: Stick bites are used to get an incisal plane or edge position for smile line and for mid line. GD: Why are stick bites important to the lab? PL: The reason that it’s important is because it basically will give us the patient’s face from a cosmetic standpoint that we can relate back to the articulator. So when we’re designing a smile we’ll be able to utilize that to eliminate smile line cants, midline cants, [and] any type of shift from left to right in the patient’s face. 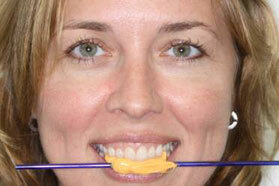 We can utilize that to maintain a correct smile line. GD: What is the best method that dentists can use for a stick bite? PL: I’d have the patient stand with their back to a stationary object and then I would have the patient smile. Sometimes what [dentists] will do is they’ll take the stick bite to the inner pupillary line and that is not really always the best case, because generally a patient will have one eye that is higher than the other. So what I would recommend is to use the long axis of the face to maintain that the stick is perpendicular to [it]. Make sure that when [dentists] are telling the patient to look at them as they’re adjusting the stick bite, that they have the patient look through them, not at them. Then step to the side and get a profile of the stick bite to make sure that one side isn’t out further than another. Then take a photograph. GD: What’s the most common mistake with stick bites? PL: Some doctors will use – if they have blinds that are horizontal – they’ll use those blinds somewhat as a reference. I don’t like using that because their blinds could be off and then the smile would be off. That’s why I would want it to be to the long axis of the face, not anything else. Paul’s advice in a nutshell: (1) Don’t use blinds for a reference, (2) Use the long axis of the face, and (3) Always take a photograph for the lab. For more advice on working effectively with the dental lab, check out our posts on step-by-step use of the diagnostic wax up kit and why the disposable triple tray can contribute to unnecessary remakes.